MIAMI, FL – There are three college football bowl games listed on the schedule for today, Friday, Dec. 28, and here is how you can watch them live on your television and streaming platforms. All three games will be available on ESPN, with WatchESPN providing the live streaming coverage for those who are unable to take in the action on their TVs. The first of the three battles will start at 1:30 pm ET at the Nissan Stadium in Nashville, Ten., where Auburn and Purdue will meet in the Music City Bowl. ESPN’s Football Power Index is giving the Tigers a 58.8 percent chance to win on Friday and close out what has turned out to be a limited season for Gus Malzahn’s team, which started the term ranked in the Top 10. 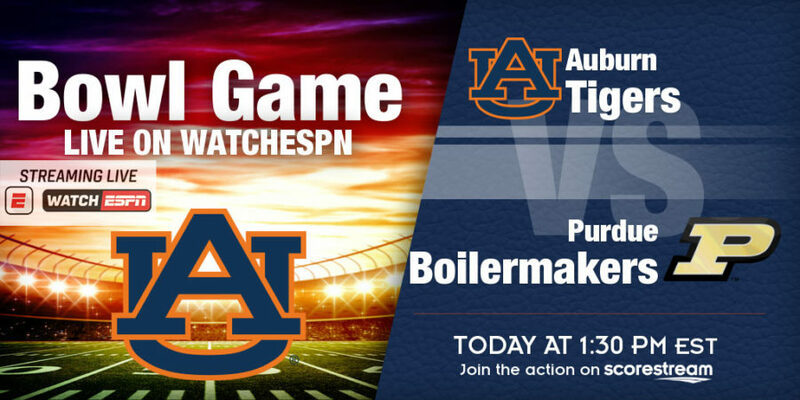 The meeting will see Auburn (7-5) and Purdue (6-6) facing off for the first time, but it is the sixth straight bowl appearance for the Tigers. In their previous Music City Bowl appearance in 2003, the Tigers secured a 28-14 victory over Wisconsin. Meanwhile the Boilermakers, who finished third in the Big Ten West, also had a patchy season, but picked signature wins over three ranked teams, including ending Ohio States (then-No. 2) College Football Playoff hunt with a 49-20 blowout victory. Purdue also had wins against ranked teams Boston College (23) and Iowa (19). The second battle on the day will see No. 19 and No. 20 Syracuse clashing in the Camping World Bowl in Orlando. Kick-off time for this contest is set for 5:15 pm ET at the Camping World Stadium. The Mountaineers was ranked as high as No. 6 at one point in time and owned one of college football’s best offenses this season, but back-to-back defeats to end the regular season fixtures and a defeat to Iowa State on Oct 13 ended their push for a College Football Playoff spot. West Virginia (8-3) comes into this game without star quarterback Will Grier, who has chosen to sit out the bowl game to focus on the upcoming NFL draft. Syracuse (9-3) will be making its first bowl appearance since 2013 and the Orange will be hoping to build on finishing second in the ACC Atlantic Division. In the meantime, No. 25 Iowa State and No. 12 Washington State will close out the day with the clash for the Alamo Bowl at the Alamodome in San Antonio, Tex. According to ESPN’s Football Power Index, the Cougars (10-2) have a 63.7 percent chance to beat the Cyclones (8-4), who won two in a row and seven in their last eight games overall. Washington State heads into this game looking to bounce back from the defeat to Washington in Pac-12 North Division title game, but has won seven out of the last eight overall.